The second-floor event space christened Martinson Hall is complete and the feature of a 11,080 square foot historic building still in the process of being renovated by National Construction. The historic renovation was driven in part by a new tax increment district (TID) in the Madison suburb’s downtown. National Construction completed extensive structural work while retaining the integrity of unique original elements such as the brick walls. Four bathrooms and a ramp, elevator and other modifications were completed for accessibility and increased functionality. 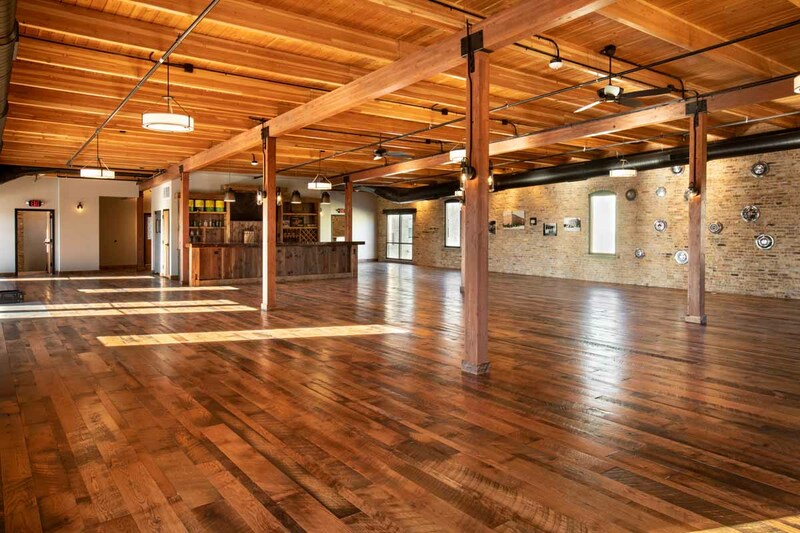 Event coordinators describe the space as having historic charm and industrial design. Features include a custom wood top, lacquered bar; reclaimed barn wood flooring; and custom metal railing. A new 1,633 square foot second-floor outdoor patio was constructed and overlooks the Military Ridge Bike Trail. The building was originally constructed in 1912 and housed the Reilly Brothers Farm Implement Store and several other businesses through its history, including that of its namesake entrepreneurs Olaus and Sever Martinson.